If you are a person of a certain age, you probably have fond memories of John Hughes’ films. Even though I was already in my early 20’s when he started producing arguably the best teen movies ever – I was still young enough to see myself in the characters he committed to celluloid. Sixteen Candles is my all-time favourite Hughes film, for reasons which will be apparent to anyone who has ever seen the film. I still watch it occasionally and it still makes me laugh and it breaks my heart a little now that Hughes has died. Yes, you can argue that Jake Ryan isn’t perfect – he did let an underage, unlicensed driver take his very drunk girlfriend home in his father’s Mercedes, but it was the 80’s and, come on, Jake Ryan is pretty damn dreamy. Also, who didn’t see some part of themselves in the other characters on the screen: Molly Ringwald’s slightly awkward Samantha Baker, Anthony Michael Hall’s loveable dork. Everyone you ever went to high school with is lovingly represented in this flick and in Hughes’ other teen masterpieces, Pretty in Pink, The Breakfast Club, and Ferris Bueller’s Day Off. I would posit that John Green is this generation’s John Hughes and I hope Mr. Green will consider that a compliment because it is certainly meant as one. Last year because everyone and their dog was reading The Fault in Our Stars I did, too. That was a reading experience I will never forget – curled in the fetal position on my bed at 2 a.m., laughing then crying, then laughing again. That is the experience I want my students to have. The only other John Green book I have in my classroom library is Paper Towns and I just finished it yesterday. (Trust me, I’ll be rectifying the lack of Green books post-haste.) 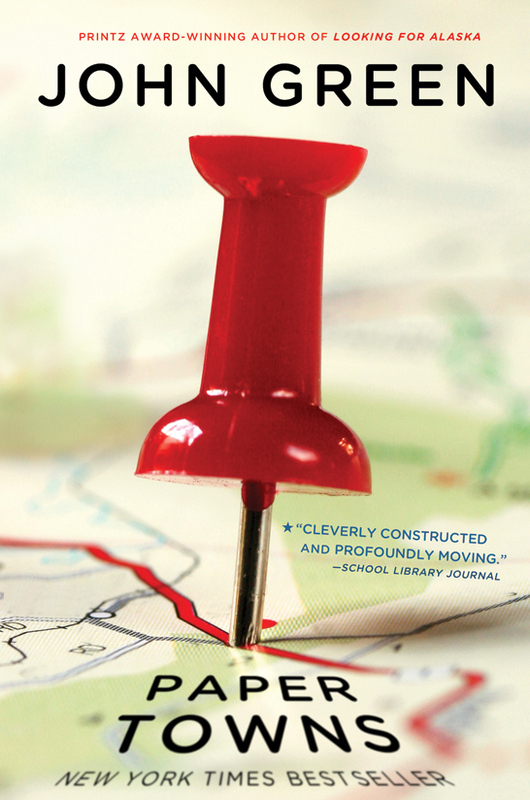 Paper Towns received rave reviews and the Edgar Award (a prize awarded by the Mystery Writers of America) and it’s totally deserving of both. Quentin Jacobsen is just weeks away from graduating from high school when his next door neighbour Margo Roth Spiegelman shows up at his window in the middle of the night. Although Quentin and Margo had been childhood friends, they’d drifted apart as they’d gotten older and now, in Quentin’s eyes at least, Margo is this exotic and beautiful creature, but not necessarily his friend. Margo Roth Spiegelman, whose six-syllable name was often spoken in its entirety with a kind of quiet reverence. Margo Roth Spiegelman, whose stories of epic adventures would blow through school like a summer storm: an old guy living in a broken-down house in Hot Coffee, Mississippi, taught Margo how to play guitar. Margo Roth Spiegelman, who spent three days traveling with the circus – they thought she had potential on the trapeze. The stories, when they were shared, inevitably ended with, I mean, can you believe it? We often could not, but they always proved true. Anyway, Margo needs Quentin’s help. She also assures him that this will be the best night of his life. Quentin is a guy who generally plays by the rules, so his decision to help Margo is slightly out of character for him. Nevertheless, he helps Margo carry out a list of tasks, some of them vengeful and some of them contemplative and he is indeed changed by the experience. Which is why when Margo suddenly disappears, he is compelled to follow the breadcrumb trail of clues she’s left behind. Paper Towns is a clever mystery for sure, but that’s not the only reason to admire the heck out of it. What I love about John Green is the way he writes dialogue. His characters are smart and funny and honest-to-goodness people. In the same way that John Hughes made his characters painfully awkward or awesome or self-deprecating or ironic, Green’s teens are whole and fragile and super smart and laugh-out-loud funny. Quentin’s journey to find Margo makes him question not only everything he thought he knew about her, but also everything he believes about himself and Green does a great service to his characters (and the young adults who will be reading this book) by not giving us pat answers. So – read John Green. Watch John Hughes. Through their eyes you’ll see teenagers at their worst…and their best. And it’s all beautiful. This entry was posted in Book Chat and tagged 2013, Book Review, favourite authors, highly recommended, mature teen, mystery, page turner, prize winner, teen, YA by Christie. Bookmark the permalink.